A row of buildings on East Seventh Street. MANHATTAN — Millennials, be forewarned before moving to the Big Apple: You'll need a roommate, you'll likely pay at least $1,000 a month, and don't bet on settling in Manhattan. Nearly 72 percent of Millennials shared their home with someone other than their partner in 2016, according to a report from New York City Comptroller Scott Stringer. And now is the time of year that many of these young New Yorkers are searching for new digs. The third week of August tends to the busiest single week for renters because of the flood of college students coming to New York and recent grads starting new jobs in September, according to the roommate-search app SpareRoom. The city’s streets around universities such as NYU, Columbia and Barnard will soon be cordoned off on Aug. 27 for the annual rite of “move-in day,” when families help their kids haul their stuff into dorm rooms. But for those opting out of on-campus life or moving beyond the dorms, there are ways to find something pretty quickly. It typically takes 11 days to find a roommate in New York City, according SpareRoom, which kicked off a week of online mindfulness tutorials Monday in addition to its regular face-to-face free “Speed Roommating” events. “The more stressed you get, the less likely you’re going to make the right decision,” said SpareRoom director Matt Hutchinson. 1. Odds are slim that you can afford to live in Manhattan by yourself. The median rent — representing the midpoint of the market — for a studio in Manhattan was $2,600 a month this past July, according to a report from Douglas Elliman. The general rule of thumb — and what many landlords require — is for renters to pay no more than 30 percent of their total income toward rent. That means you would need to earn $104,000 a year for the median-priced studio. That is far more than what most New Yorkers earn, entry-level or not, as the median household income here is $50,711, according to Census data. 2. Even living with a roommate can be pricey. The median price for a room in the second quarter of 2017 was $1,200 a month, up from $1,100 a month for the same time last year, according a report released last week from roommate app Roomi. That price tag would be affordable to someone earning $48,000 a year. 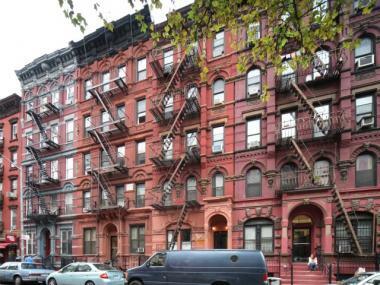 The priciest rooms were in the East Village, costing up to $1,730 a month — and that’s where many Millennials think they want to live until they see the prices, said Roomi CEO Ajay Yadav said, noting there is often a mismatch between desire and reality. The East Village was the second-most-popular area that users searched for, following Alphabet City. Other expensive areas included Stuyvesant Town ($1,667 a room), Midtown and Downtown Brooklyn ($1,650 a room), and Lower Manhattan ($1,600 a room). 3. Of course, not all neighborhoods ask four digits to rent a room. Roommate hunters could score the cheapest digs on its platform in Jamaica, on the far edges of Queens near JFK Airport, where monthly rents started at $775, the Roomi report found. Next on the list for inexpensive options were: Bensonhurst ($780 a room), East Bronx and Jackson Heights ($800 a room), and Brownsville ($813 a room). Jamaica offers easy access to the airport and a host of different ethnic foods reflecting “its nature as a tight-knit yet relaxed community,” the report said. 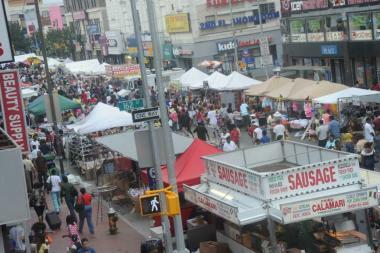 An image of the Jamaica JAMS festival on Jamaica Avenue when streets are closed off to vehicular traffic. Real estate search engine StreetEasy predicted that Jamaica would be the hottest neighborhood of 2016, as the development of apartment buildings and hotels kicked into high gear. That didn’t mean that Roomi’s users were necessarily flocking to the area. The neighborhood didn’t even crack the top 20 when it came to the areas receiving the most applications per listing in June. Greenwood, it turns out, was No. 1 for Millennial renters, according to Roomi’s report. The quiet neighborhood bordering the historic Green-Wood Cemetery and sandwiched between South Slope and Sunset Park had roughly 27 applications per listing, Roomi found. The odds were slim because so were the offerings: It had just 14 listings from April to June, with room rents averaging $1,050 a month. Roomi suggested some options for those looking to spend about $1,000: Bay Ridge and Ridgewood (averaging $900 a room), Bedford-Stuyvesant and Astoria (averaging $1,000 a month) and Long Island City (averaging $1,050 a month). These areas, the report highlighted, have relatively easy subway access to Manhattan — and now ferry service, in some cases — and their own bustling restaurant scenes. 5. Brooklyn tends to be most popular for listings and for roommate hunters. The most popular areas when it came to sheer number of applicants were Bushwick, Upper Manhattan and Bedford-Stuyvesant. Rooms in all three neighborhoods averaged $1,108 a month, according to Roomi’s June stats. A SpareRoom analysis found that 43 percent of all listings on its site were in Brooklyn, followed by 41 percent in Manhattan. Twelve percent were in Queens, 4 percent in The Bronx and less than 1 percent were in Staten Island. The Bed-Stuy/Bushwick/Ocean Hill ZIP code of 11221 has the highest number of listings on SpareRoom (with rent averaging $1,043 a month), followed by the 10009 ZIP code of Alphabet City/Stuy Town/East Village (with rent averaging $1,651 a month) and Bed-Stuy/Bushwick/Williamsburg’s 11206 ZIP code (with rent averaging $1,152 a month). 6. Roommates and those with rooms to fill are looking for more transparency. Only 47 percent of SpareRoom users looking for roommates said they would definitely respond to a message from someone on the site without a “room wanted ad,” which includes a profile with information about who they are and what they’re looking for, Hutchinson said. That’s why his site encourages those looking for rooms to post such ads. In general, there are mounting concerns about oversight and accountability with the rise of peer-to-peer networks like Uber and Airbnb, and the same concerns exist in the roommate-finding sphere, Yadav said. That’s why Roomi plans next week to launch a service providing background checks for those who list apartments and those who rent them. The company has been testing the feature, which is free for listers, and found that those renting rooms prefer their roommates have checks, as well. “It’s so important,” said Yadav, whose own experience of being robbed of his belongings and security deposit by a roommate he didn’t know well prompted him to launch his company. It’s also important to have some sort of agreement in writing, Yadav noted, especially since roommates are often not listed on the lease. His firm will also start offering a service providing a contract template that can be customized, allowing for roommates to set house rules. “We’re trying to make sure there’s more transparency,” Yadav said.